With thousands of deals from over 50,000 retailers, RetailMeNot is the go-to destination for money-savvy shoppers. RetailMeNot wanted to expand the value of their iPhone app beyond the checkout line, and into the earlier stages of anticipating, planning, and hunting for deals. They partnered with digital agency FreeAssociation to redesign the store page, which was the primary page users went to find deals. I was hired to lead the content strategy and UX improvements of the project. After launch, the redesign won a People’s Choice Webby Award for best mobile shopping. The process began by gathering insights from casual users to extreme coupon clippers. Based on their common pain points while using the app and shopping for deals, I created aspirational user goals and design prompts to explore initial low-fidelity solutions. How can we find ways to save them time while searching for deals? How can we offer them ways to personalize the app, and surface more of what they need/less of what they don't? How can we parse the firehose of information to make the deals more enjoyable to browse? How can we positively reinforce ongoing engagement in the app, or loyalty with an individual store? We tested low-fidelity sketches with users to figure out what resonated most. Explorations focused on bringing more meaning to the list through strategic bucketing and labeling, and using the prompts to ideate on new product display modules, time/location modules, and empty states. On the business side, I explored special design treatments and modules to elevate partner store offerings and increase incentives to become partners. I created an easy-to-update modular design system based on what resonated most during testing. Below are a few examples of the high-fidelity wireframes I designed. A well-organized sketch file of design components made it easy for the internal team to reference. 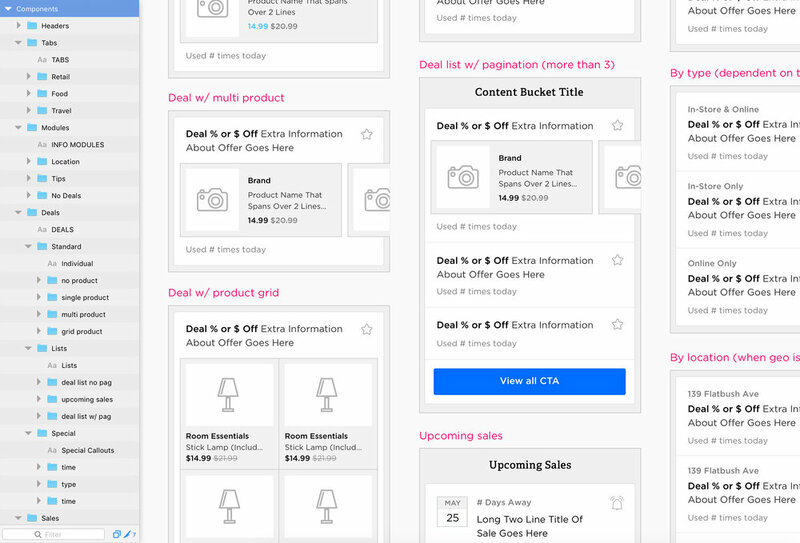 RetailMeNot’s internal team then carried out the visual design and development of the app, which went on to win a People’s Choice Webby Award for best mobile shopping experience.